The world famous lions of Yorkshire Wildlife Park are celebrating the landmark fifth anniversary since they were saved from the hell of a squalid eastern European zoo. 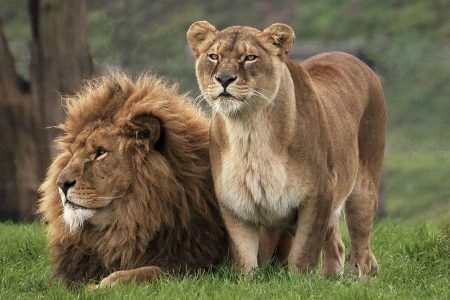 Their rescue will be marked by Lion Day on the Bank Holiday Monday, May 25, as part of the activity-packed Love Your Zoo Week for visitors during a fun-packed half-term break. The neglected pride was kept in filthy concrete pens, fed on a meagre diet of scraps and faced an uncertain future before a massive public campaign co-ordinated by the YWP brought them to the UK and a new, healthy life roaming a purpose-built nine-acre home with a lake, waterfall, rocks and grassland. The 13 lions, who included two cubs aged just eight months old, rediscovered their health and have been a favourite with visitors to the award-winning park, near Doncaster, ever since. The £150,000 mercy mission was described as the ‘biggest ever cat rescue’ giving them a whole new life thanks to the dedication of YWP staff. The lions were carefully nurtured and rehabilitated back to health by veterinary experts and YWP staff at the enclosure, at the park at Branton. Sadly since then, the eldest lion Johnny Senior passed away in June 2012 after his health declined, Cezar and Johnny Junior and the oldest female Frieda in 2014. The remaining 9 lions can still be seen enjoying themselves around the central lake and waterfall of Lion Country, the largest non-drive through lion reserve in the country.